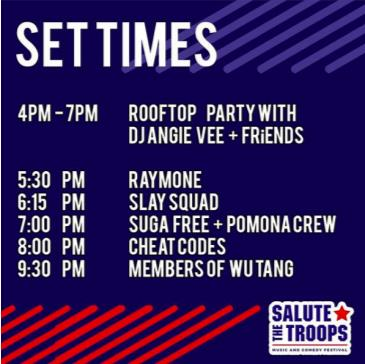 Salute The Troops Music and Comedy Festival March 22nd - 24th in Pomona! It’s a full weekend of music and comedy for a great cause! For every full price ticket sold, an Active Service Member will receive a free ticket. For more information please visit SaluteTheTroops.com. Salute The Troops. Healing Through Music.